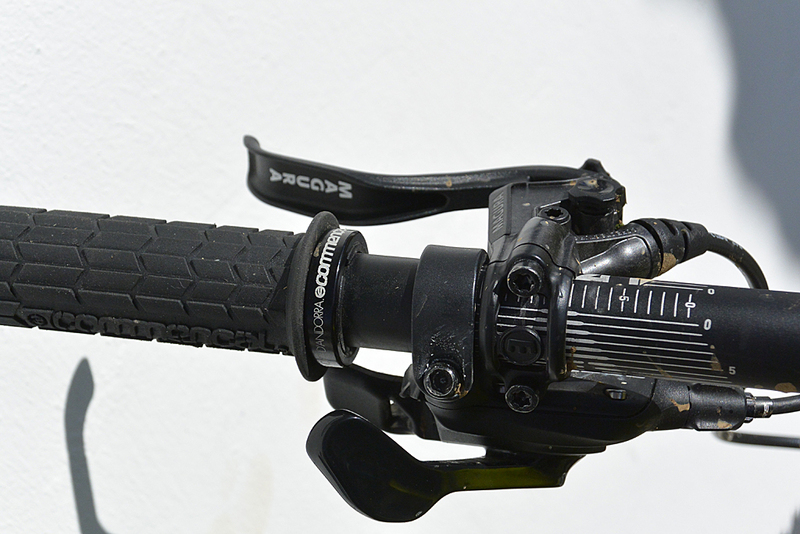 New trail and all-mountain MT7 and MT5 brakes from German equipment manufacturer Magura. 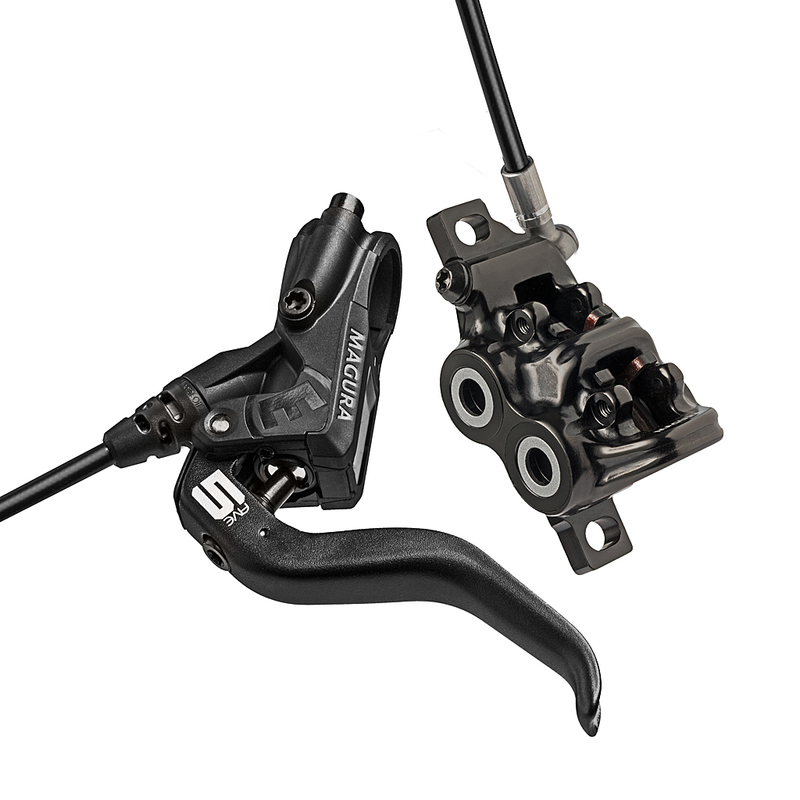 German disc brake manufacturer Magura has added two new four-piston brakes to its range for 2015. 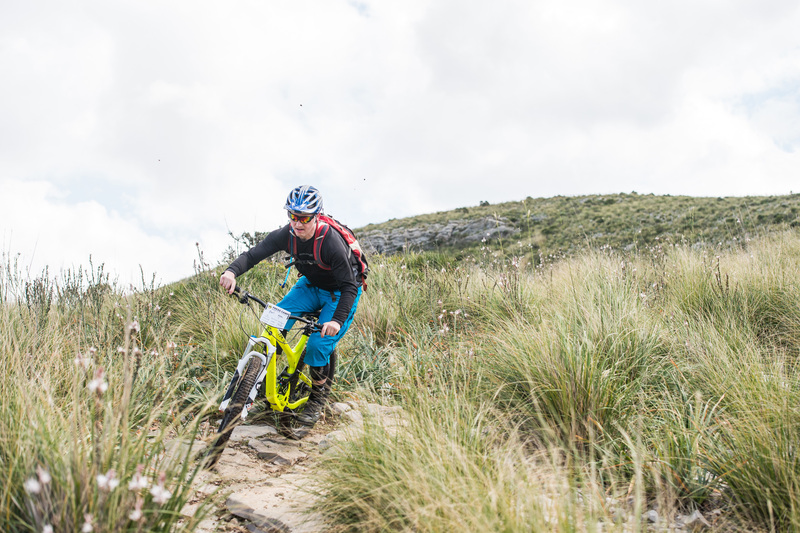 Called the MT7 and MT5, they’re aimed at the trail and all-mountain rider. The Magura MT7 is the top boy of the two new arrivals and uses a carbon fibre (called Carbotecture SL) housing and two-finger, aluminium lever with tool-free reach and bite point adjustment to allow riders to fine-tune brake feel. The caliper is a one-piece forged aluminium design with a new connecting bridge across the top to increase stiffness. Inside are four individual brake pads held in place by magnetised pistons. Weight is around 380g, and the MT7 costs approximately £250 an end. 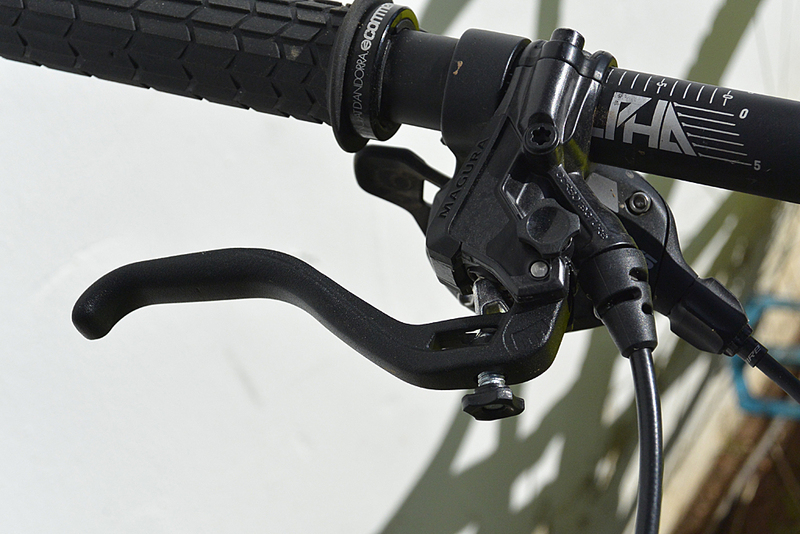 An aluminium bar clamp and cheaper lever construction makes the MT5 slightly heavier than the MT7, but at around £150 per end it is more affordable. The forged caliper is identical to the MT7, but it uses a slightly different pad design. There are two braking surfaces on the MT5 pads but they’re mounted to a one-piece backing plate. The pad material is thinner, but once it wears out you can upgrade to the MT7 pads, as they’re cross compatible. 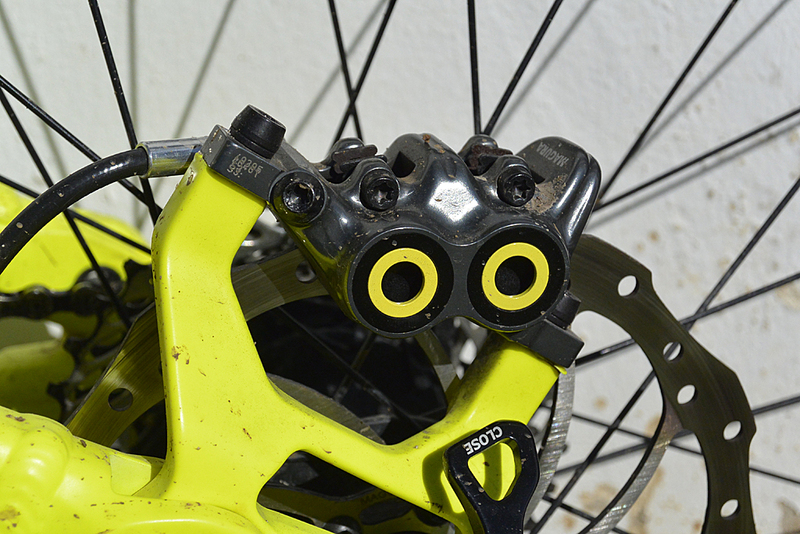 Magura has increased the power in the both brakes by around 15 per cent by using four 17mm pistons instead of two 22mm pistons found in the twin pot brakes. There’s more hydraulic leverage but this does have an effect on pad spacing — the four-piston brakes are run slightly closer to the rotors. However, to ensure effective pad retraction Magura is using a magnetic interface rather than relying on the pad springs that you find in SRAM and Shimano brakes. Like the current Magura disc brakes, the MT7 and MT5 use a radial piston design, which means the master cylinder/main piston is perpendicular to the handlebar. Magura says the design is more compact and frees up space on the handlebar, but the design also saves quite a bit of weight compared to an in-line design. The downside of all radial designs is they place the brake lever quite far out in front of the bar and, even with the reach adjustment set at minimum, getting fingers on the lever can be a stretch. To compensate, the pivot position has moved 20mm closer on the new brakes, but the lever on the MT7 is still not as close as we’d like. The MT5 can be run closer, and this is the brake we’d recommend if you have small hands or like to run your levers close in. Riding on unfamiliar terrain doesn’t tell you much about how a product performs, but initial impressions were very good. There’s a light lever action and plenty of stopping power, which is delivered in a smooth and controlled way. The ergonomics have been improved and the tool-free adjustments are handy additions. Potentially the new pad design offers better heat dissipation, reduced wear rate and — despite being double the number — should be easier to fit. A sample set of the new four piston brakes are on their way, so we’ll run a full test in the magazine in a few months’ time.